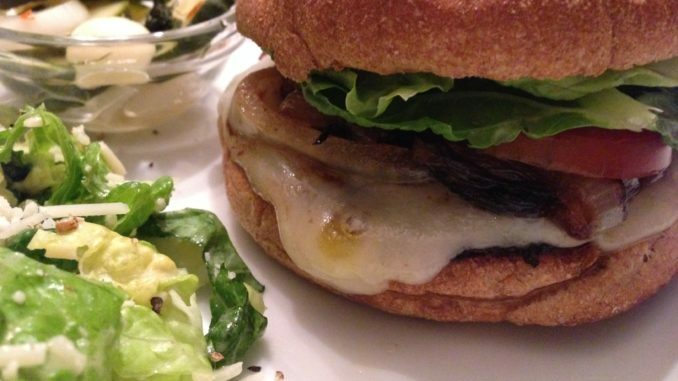 Grilled Portobello Mushroom Sandwich. Can a meaty mushroom really substitute for a meat patty? Maybe. 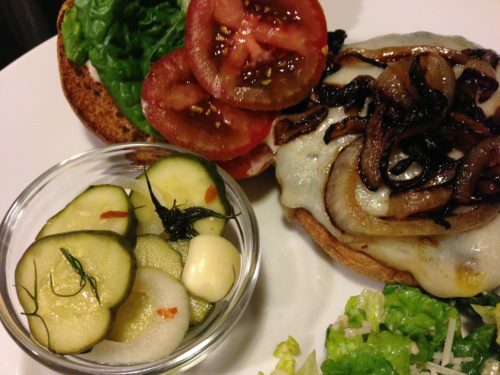 My Grilled Portobello Mushroom Sandwich is a hit with everyone who loves mushrooms. I like to add this sandwich to my lunch and dinner menus even though I still eat meat burgers once in a while. This is a tasty #MeatlessMonday meal. Many of you know by now that I’m trying to move towards a more plant-based diet. I’ve always loved vegetables and fruits. I ensure that I eat a lot of salads per week and at least one vegetable with my main courses for lunches and dinners. Fruits are added to breakfasts or are enjoyed as snacks or dessert. And I’m trying to add more plant-based entrees to my diet. Lucky for me, my husband also likes fresh veggies and fruits and grew up eating a lot of fresh produce. 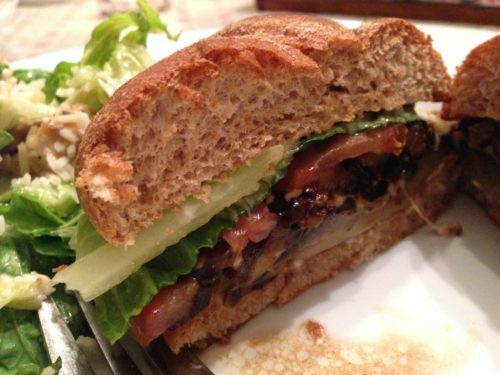 Although he still likes his meats and cheeses, he does like my “meaty” Grilled Portobello Mushroom Sandwich. 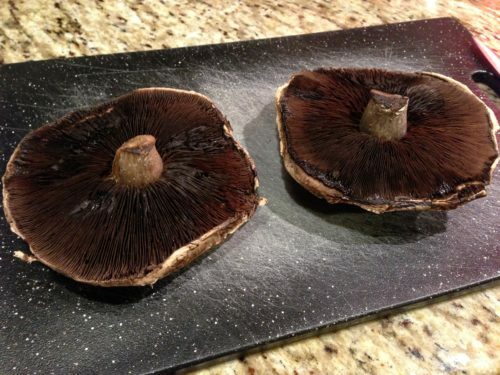 Portobello Mushrooms are large brown mushrooms, usually sold as giant mushroom caps with stems removed. The smaller brown mushrooms are called creminis. 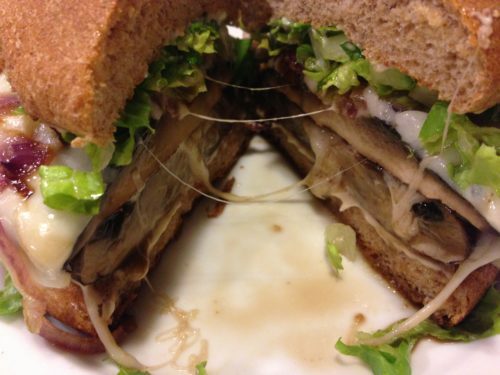 At my house, we eat a lot of raw and cooked mushrooms in salads, pasta dishes, on sandwiches, and with entrees. I find it interesting that a lot of people don’t like mushrooms. Whether it is the taste or texture, it just baffles me because I love mushrooms. 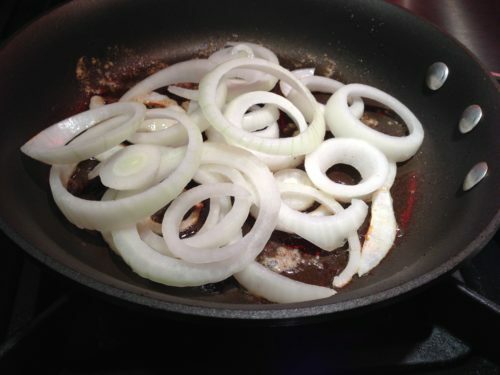 For this sandwich, I like to caramelize some sweet onions in olive oil in a non-stick skillet to start. The onions are done when they are golden brown to deep brown. Set them aside. You can remove the stems and gills from the mushroom caps before grilling them. 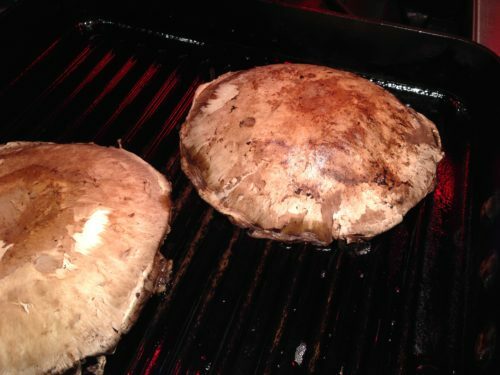 Then grill the mushroom caps in a grill pan or a non-stick skillet starting on the gill side. I prefer to grill the mushrooms in a pan rather than on a regular outdoor grill but that’s just my preference. Turn over the mushroom caps when they are slightly soft. Continue to cook until the mushrooms have softened but are still holding together. 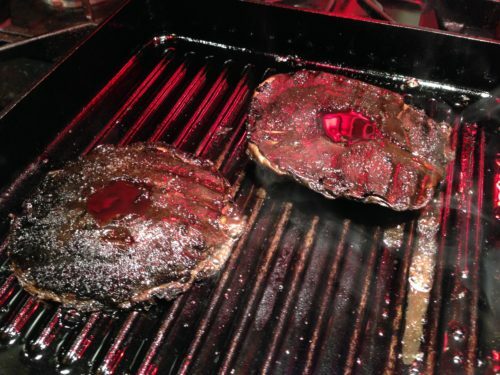 Add a splash of balsamic vinegar to the cooked mushrooms. Before you remove the mushrooms from the pan, add a slice of your favorite cheese to each mushroom and then top the cheese with the caramelized onions. 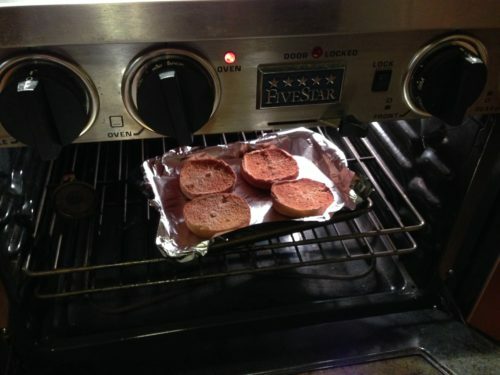 Lightly toast some whole grain burger or sandwich buns under the broiler. 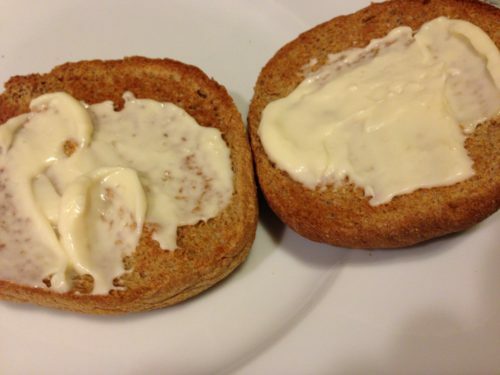 Spread some garlic aioli (mayonnaise mixed with minced garlic) onto the toasted buns. Assemble the sandwiches and serve with lettuce and tomato. My Easy Spicy Dill Refrigerator Pickles are a good condiment to pair with this sandwich. You could also serve a side salad such as a Caesar. 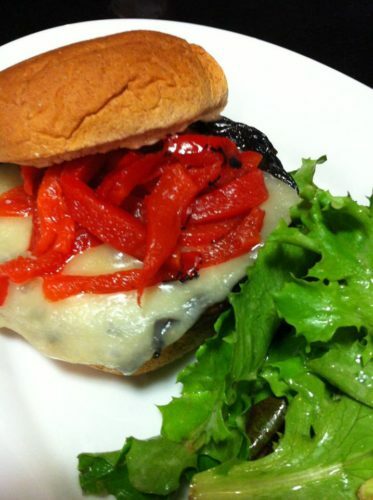 Instead of caramelized onions, sometimes I serve this sandwich with sliced roasted red bell pepper. And for my meat-loving guests, I will sometimes add a slice of crispy bacon. 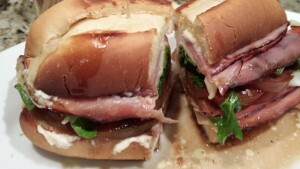 This sandwich can be messy so do offer lots of napkins. 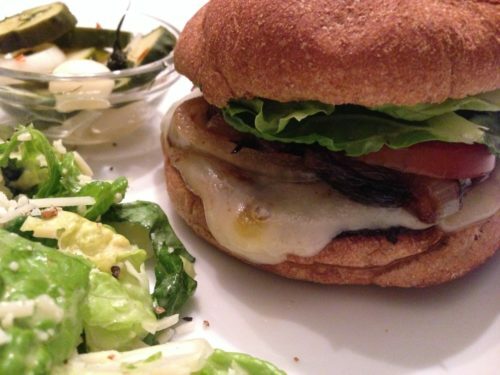 You can make two grilled portobello mushroom caps per sandwich for “Double-decker Grilled Portobello Mushroom” sandwiches. 1. Warm one tablespoon of olive oil or two tablespoons of vegetable stock in a skillet. 2. 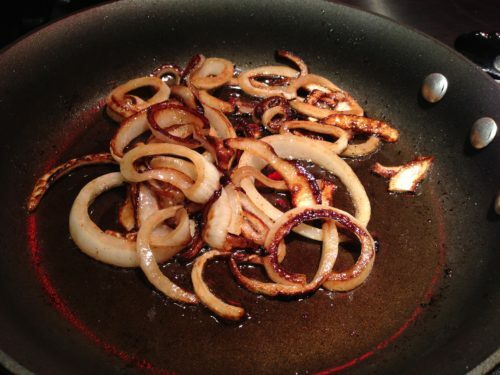 Add the sliced onions and cook them over medium heat until they are light brown and caramelized. 3. 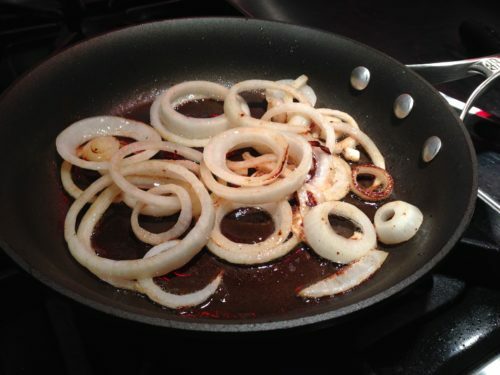 Drizzle some balsamic vinegar over the caramelized onions and stir. 4. Season the onions with salt and pepper and set aside. Keep warm. 5. You can trim the mushroom caps to remove the small stem stub and if you don’t like the gills, you can carefully scrape them off. 6. In a grill pan or non-stick skillet, warm the other tablespoon of olive oil or 2 tablespoons of vegetable stock. 7. Start to saute the mushroom caps, gill side down, in the olive oil. 8. Once the mushroom caps have started to soften, turn them over. 9. 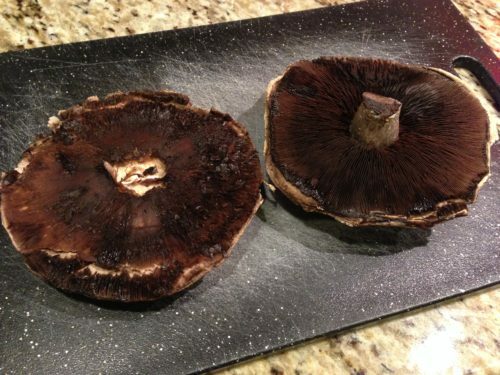 Drizzle some balsamic vinegar over the mushroom caps (gill side). 10. 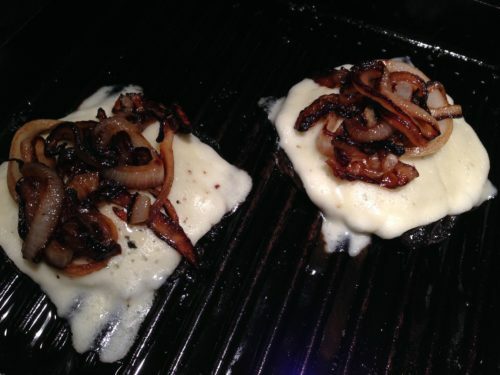 At this point, you can add the optional cheese slices so they can melt on top of the mushrooms (gill side up). 11. 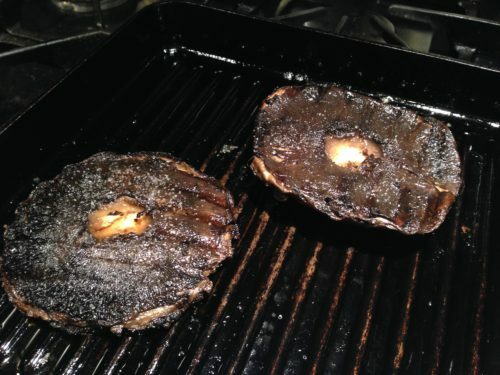 When the mushrooms have softened and are cooked through, remove them from the heat. 12. 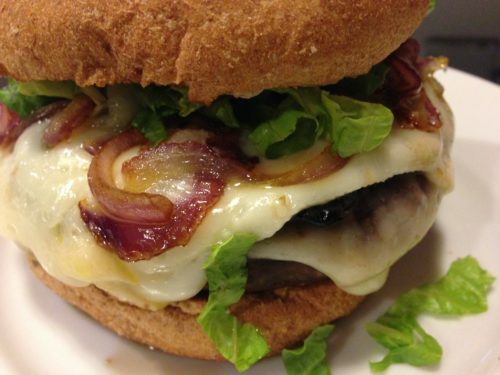 Mix together the mayonnaise and the garlic and spread the garlic aioli mixture onto the toasted burger buns. 13. Place a mushroom on each burger bun bottom. 14. 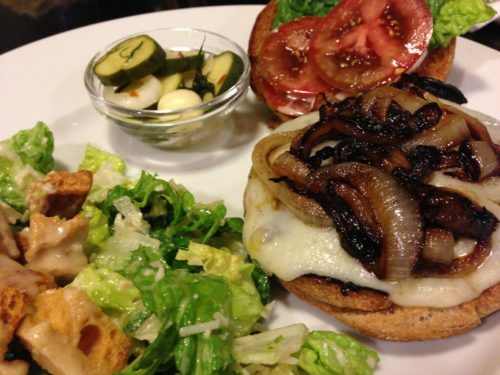 Top the mushrooms with the caramelized onions, roasted red pepper, tomato, and lettuce. 15. Add the bun tops and serve! Serves 4. 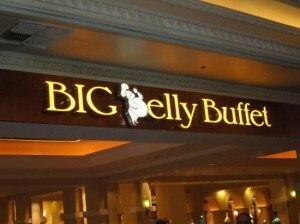 Offer with a side of my Caesar Salad, my Colorful Chopped Salad, my Healthy Bean Salad or oven fries. My Easy Spicy Dill Refrigerator Pickles are a nice addition, too. Variations: Add other vegetables that you like including sliced cucumber, grated carrot, roasted corn, etc. Instead of the garlic aioli, you could substitute hummus. 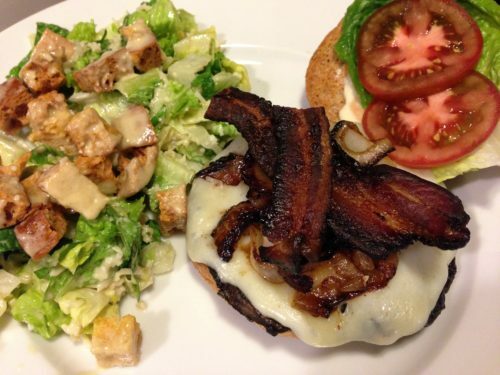 For the meat eaters who can’t live without meat, add some crispy bacon strips to the sandwich when assembling. Try a different cheese flavor or omit the cheese overall. Use a pita or wrap for this sandwich. You can slice the mushroom caps and saute with the onions if you don’t like the consistency of the whole grilled mushroom in a sandwich. This sandwich tastes great cold. Just chill the grilled mushrooms and caramelized onions and assemble your cold sandwiches for a picnic or to take to work or school.